Current Events – Page 2 – Hot Pinoy! UPDATE4: The Philippine Atmospheric, Geophysical and Astronomical Services Administration (PAG-ASA) Forecasting Center have reported this 5:00 a.m. that typhoon “PEPENG” (International codename: Parma) has accelerated as it continues to move towards Cagayan. 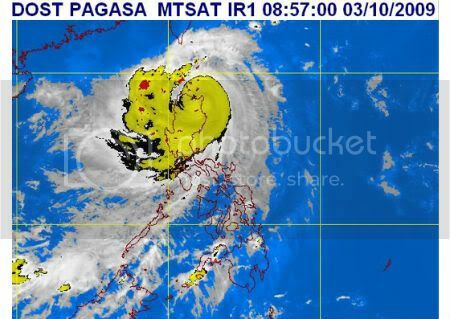 Pepeng is located at 260 km Southeast of Aparri, Cagayan (16.6°N, 123.6°E ) with maximum sustained winds of 175 kph near center and gustiness of up to 210 kph moving Northwest at 17 kph. Ilocos Sur, Benguet, La Union, Pangasinan, Nueva Ecija, Bulacan, Rizal, Rest of Aurora, Quezon, Camarines Norte, Camarines Sur and Albay. Batanes Group, Apayao, Kalinga, Ilocos Norte, Abra, Mt. Province, Ifugao, Quirino, Nueva Vizcaya, Rest of Isabela, Northern Aurora, Polilio Island and Catanduanes. Cagayan, Babuyan Island, Calayan Island and Northern Isabela. It’s expected to make landfall over Northern Cagayan by evening; 150 kms Southwest of Basco, Batanes by tomorrow (Sunday) morning; and 290 kms West Northwest of Basco, Batanes by Monday morning. Residents in low-lying areas and near mountain slopes under signals #3, #2 and #1 are advised to take all the necessary precautionary measures against possible flashfloods and landslides. Those living along the coast under signal #2 and #3 are advised to be on alert against big waves generated by the typhoon. Note: Watch out for the next bulletin to be issued at 11 A.M. today. PAG-ASA Forecasting Center have reported this 11:00 a.m. that typhoon “PEPENG” (International codename: Parma) has accelerated as it continues to move Northwest towards Cagayan. 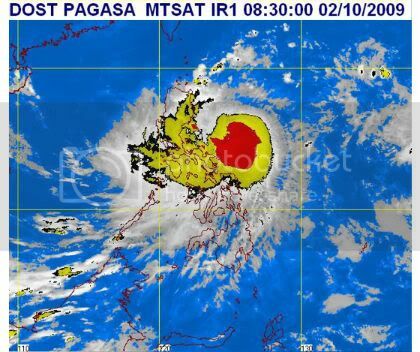 Pepeng is located at 150 km Southeast of Aparri, Cagayan or 100 km East of Tuguegarao City (17.4°N, 122.7°E ) with maximum sustained winds of 175 kph near center and gustiness of up to 210 kph moving Northwest at 17 kph. Batanes group of Island, Cagayan, Babuyan Island, Calayan Island, Ilocos Norte, Abra, Apayao, Kalinga and Northern Isabela. It’s expected to make landfall over Northern Cagayan by evening; 70 kms Northwest of Aparri, Cagayan or 50 kms South Southwest of Calayan Island by tomorrow (Sunday) morning; 120 kms West of Basco, Batanes by Monday morning; and 200 kms North Northwest of Basco, Batanes by Tuesday morning. Public Storm signals elsewhere are now lowered. Note: Watch out for the next bulletin to be issued at 5 P.M. today. PAG-ASA Forecasting Center have reported this 11:00 a.m. that typhoon “PEPENG” (International codename: Parma) has made landfall over the Eastern Coast of Cagayan and is now traversing Extreme Northern Luzon. 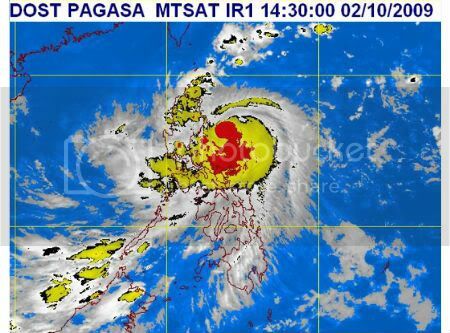 Pepeng is located at 40 kms Northeast of Tuguegarao City (17.9°N, 121.9°E) with maximum sustained winds of 175 kph near center and gustiness of up to 210 kph moving Northwest at 15 kph. Quirino, Aurora, Nueva Ecija and Pangasinan. Rest of Isabela, Ifugao, Nueva Vizcaya, Benguet and La Union. Batanes group of Island, Cagayan, Babuyan Island, Calayan Island, Ilocos Norte, Ilocos Sur, Mt. Province, Abra, Apayao, Kalinga and Northern Isabela. It’s expected to be at 210 kms West Southwest of Basco, Batanes or 220 kms Northwest of Aparri by tomorrow (Sunday) afternoon; 320 kms West Northwest of Basco, Batanes by Monday afternoon. Note: Watch out for the next bulletin to be issued at 11 P.M. today. UPDATE3: The Philippine Atmospheric, Geophysical and Astronomical Services Administration (PAG-ASA) Forecasting Center have reported this 11:00 p.m. that typhoon “PEPENG” (International codename: Parma) has changed course to the Northwest Direction and is now moving towards Cagayan. 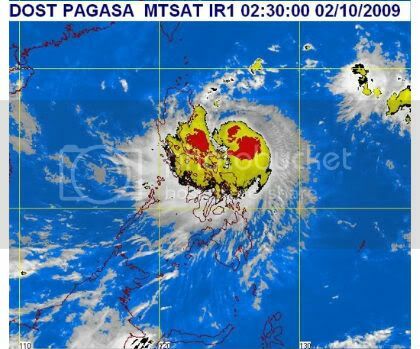 Pepeng is located at 200 kms North Northeast of Virac, Catanduanes or 380 km Southeast of Aparri, Cagayan (15.9°N, 124.6°E) with maximum sustained winds of 175 kph near center and gustiness of up to 210 kph moving Northwest at 13 kph. Batanes, Calayan Group of Islands, Babuyan Group of Islands, Ilocos Norte, Ilocos Sur, Apayao, Abra, Kalinga, Mt. Province, Ifugao, Nueva Viscaya, Benguet, La Union, Pangasinan, Tarlac, Nueva Ecija, Zambales, Bataan, Pampanga, Bulacan, Laguna, Batangas, Cavite, Rizal, Rest of Quezon, Marinduque, Albay, Burias Islands, Sorsogon, Metro Manila and Northern Samar. Cagayan, Isabela, Aurora, Quirino, Northern Quezon, Polilio Islands, Camarines Norte and Camarines Sur. It’s expected to make landfall in Northern Cagayan by tomorrow (Saturday) evening; 130 kms Northwest of Aparri, Cagayan by Sunday evening; and 170 km West of Basco, Batanes by Monday evening. Note: Watch out for the next bulletin to be issued at 5 A.M. tomorrow. PAG-ASA Forecasting Center have announced today that the forthcoming super-typhoon “Pepeng” (Parma) is located based on satellite raging through fast in the Philippine territory at 270 km East of Virac, Catanduanes with maximum sustained winds of 195 kph. The country is still trying to move-on with the saddening aftermath of typhoon Ondoy (international name, Ketsana) that Pepeng posts more fear than ever within the eyes of not just for Ondoy victims but even for those who are yet to engage the tragic experience. 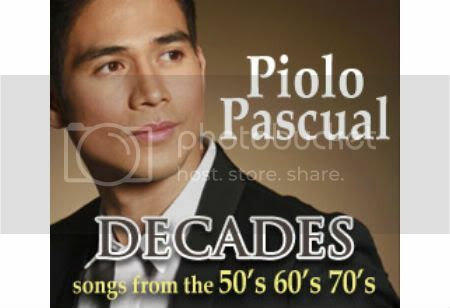 Ilocos Norte, Ilocos Sur, Abra, Apayao, Kalinga, Ifugao, Pangasinan, Zambales, Pampanga, Nueva Viscaya, Nueva Ecija, Quirino, Bulacan, Rizal, Tarlac, La Union, Cagayan (including Babuyan Islands), Isabela, Mt. Province, Benguet, Southern Quezon, Camarines Sur, Albay, Sorsogon, Burias Island and Northern Samar. Catanduanes, Camarines Norte, Northern Quezon, Aurora and Polilio Island. It’ll be helpful for our countrymen to be prepared, to keep watch and be obedient to what the local government would advise us to do so. It would be better for those who have low locations to immediately get their families to higher places or evacuation centers in their localities to avoid more casualties and make way for better distribution of relief goods and emergency assistance. PAG-ASA issued another update this 11:00 a.m. as Pepeng continues to move West Northwest and increases its threat to Isabela-Aurora area. 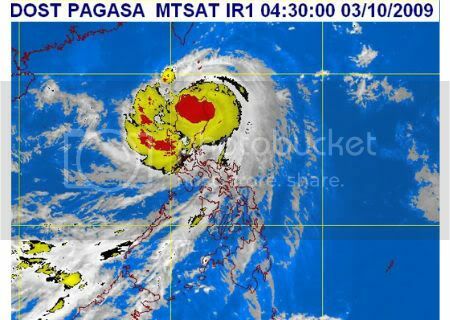 PEPENG’s Location of Center (as of 10:00 a.m.) is at 180 kms East Northeast of Virac, Catanduanes (14.9°N, 125.8°E) with Maximum sustained winds of 195 kph near center and gustiness of up to 230 kph, moving towards West Northwest at 19 kph. It’s expected to navigate and pass through at 60 kms East of Casiguran, Aurora by tomorrow (Saturday) morning; make landfall in Aurora-Isabela area by tomorrow afternoon; 80 kms West of Laoag City by Sunday morning; and 400 kms West Southwest of Basco, Batanes by Monday morning. Note: The public and the Disaster Coordinating Councils (DCC) concerned are advised to take appropriate actions and watch for the next bulletin to be issued at 5 P.M. today. 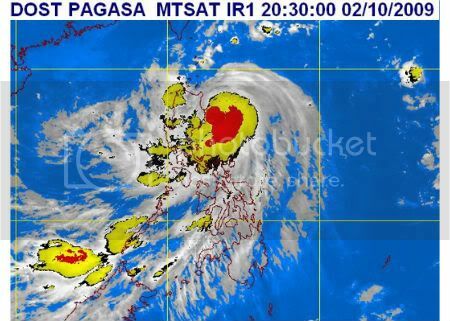 Typhoon “PEPENG” has slowed down as it continues to move towards Aurora-Isabela area. 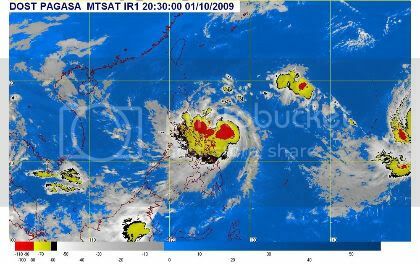 PEPENG’s Location of Center (as of 5:00 p.m.) is at 150 kms North Northeast of Virac, Catanduanes (15.1°N, 125.3°E) with Maximum sustained winds of 195 kph near center and gustiness of up to 230 kph, moving towards West Northwest at 13 kph. It’s expected to make landfall in Northern Aurora then cross Northern Luzon by tomorrow (Saturday) afternoon; 50 kms South Southwest of Laoag City by Sunday afternoon; and 230 km West Northwest of Laoag City by Monday afternoon. Calayan Group of Islands, Babuyan Group of Islands, Ilocos Norte, Ilocos Sur, Apayao, Abra, Kalinga, Mt. Province, Ifugao, Nueva Viscaya, Benguet, La Union, Pangasinan, Tarlac, Nueva Ecija, Zambales, Bataan, Pampanga, Bulacan, Laguna, Batangas, Cavite, Rizal, Rest of Quezon, Marinduque, Albay, Burias Islands, Sorsogon and Metro Manila.